"I hope this kind of experiment will lead to better understanding of how our own DNA is compacted into chromosomes, and how it unravels locally to become expressed," says biophysicist Laura Finzi. When an invading bacterium or virus starts rummaging through the contents of a cell nucleus, using proteins like tiny hands to rearrange the host’s DNA strands, it can alter the host’s biological course. The invading proteins use specific binding, firmly grabbing onto particular sequences of DNA, to bend, kink and twist the DNA strands. The invaders also use non-specific binding to grasp any part of a DNA strand, but these seemingly random bonds are weak. Emory University biophysicists have experimentally demonstrated, for the fist time, how the nonspecific binding of a protein known as the lambda repressor, or C1 protein, bends DNA and helps it close a loop that switches off virulence. The researchers also captured the first measurements of that compaction. 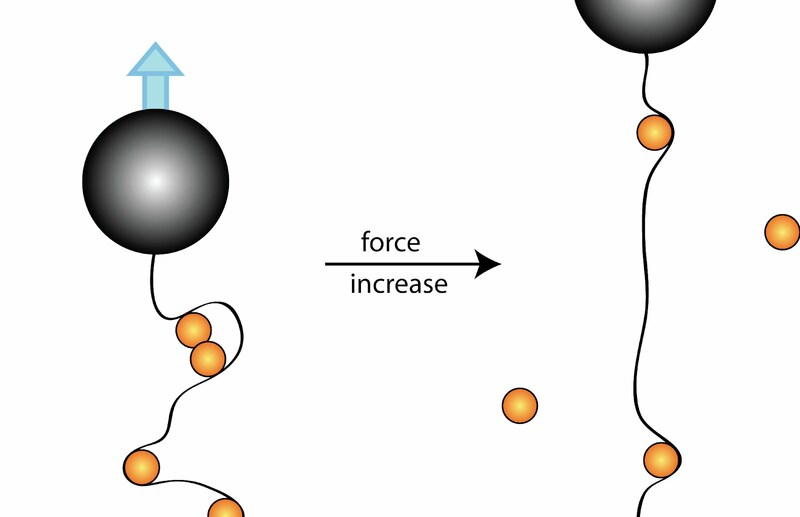 Their results, published in Physical Review E, support the idea that nonspecific binding is not so random after all, and plays a critical role in whether a pathogen remains dormant or turns virulent. 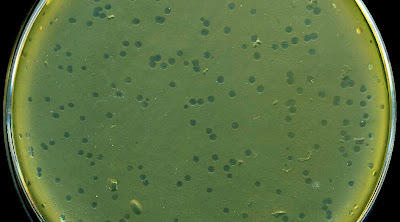 Lysis plaques of lambda phage on E. coli bacteria. C1 is the repressor protein of the lambda bacteriophage, a virus that infects the bacterial species E. coli, and a common laboratory model for the study of gene transcription. 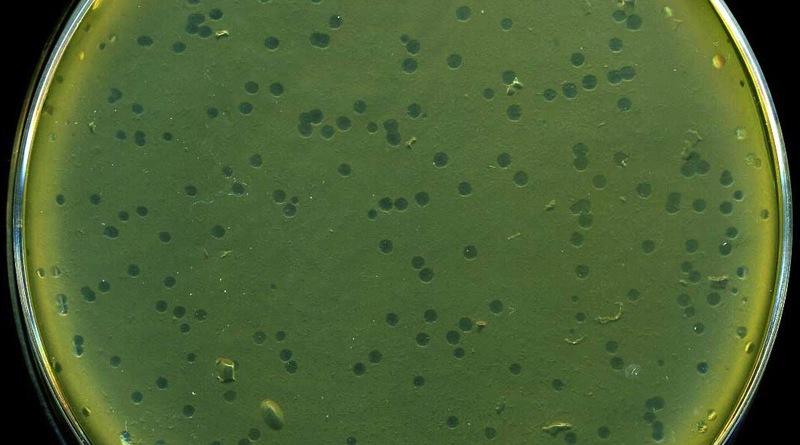 The virus infects E. coli by injecting its DNA into the host cell. 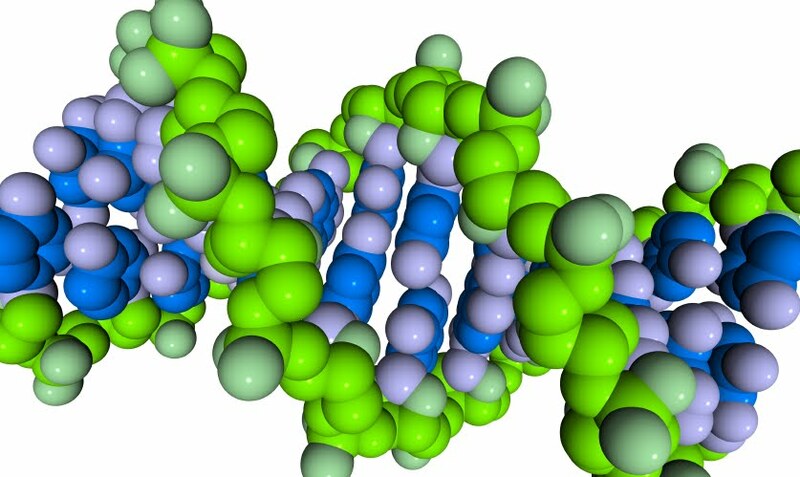 The viral DNA is then incorporated in the bacterium’s chromosome. Shortly afterwards, binding of the C1 protein to specific sequences on the viral DNA induces the formation of a loop. As long as the loop is closed, the virus remains dormant. If the loop opens, however, the machinery of the bacteria gets hi-jacked: The virus switches off the bacteria’s genes and switches on its own, turning virulent. Emory undergraduate student Chandler Fountain led the experimental part of the study. He used magnetic tweezers, which can pull on DNA molecules labeled with miniscule magnetic beads, to stretch DNA in a microscope flow chamber. 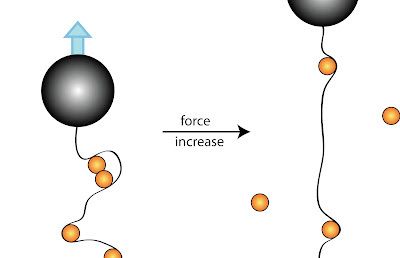 Gradually, the magnets are moved closer to the DNA, pulling it further, so the length of the DNA extension can be plotted against the applied force. An analysis of the data suggests that, while the specific binding of the C1 protein forms the loop, the non-specific binding acts like a kind of zipper, facilitating the closure of the loop, and keeping it stable until the signal comes to open it. The information about how the C1 genetic switch works may provide insights into the workings of other genetic switches. Other authors on the paper include Sachin Goyal, formerly a post-doc in the Finzi lab; Emory cell biologist David Dunlap; and Emory theoretical physicist Fereydoon Family. The research was funded by the National Institutes of Health. Image credits: DNA (top) by iStockphoto.com; lamba phage by Madboy via Wikipedia Commons.